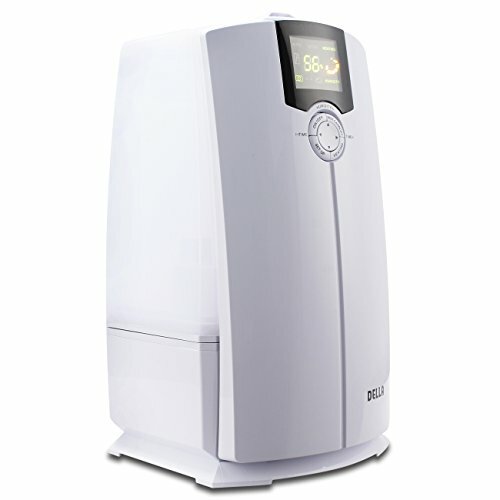 This 4L Della Ultrasonic Cool and Warm Mist Humidifier feature a visible mist operation, which allows you to see and feel the soothing sensation for up to 12 hours. This humidifier uses ultrasonic technology for a virtually silent operation and does not require replacement wicks/filters. It has button control with a digital back-lit display. It's time for you to put the humidity back into the air and live life comfortably. It will alleviate or reduce chapped lips, cracked, itchy dry skin and even seasonal cold symptoms. 【Live Better. Breathe Easier】You'll enjoy easier breathing & better air all around. Whether at home, in your RV or boat, or at the office, your environment will no longer feel parched and dry. This is your perfect solution for keeping everyone happy, including your family, your pets, your furniture, your wood floors, your musical instruments, your paintings, & more. 【Into the Mist】Control the mist amount with low, middle, and high settings. Use the 360 degree nozzle to have the mist come out in any direction you desire.